Zimbabwe’s military has taken over the public broadcaster and other public buildings in what looks like a coup, a day after they issued threats to the ruling Zanu PF party to stop the purge of former liberation fighters. 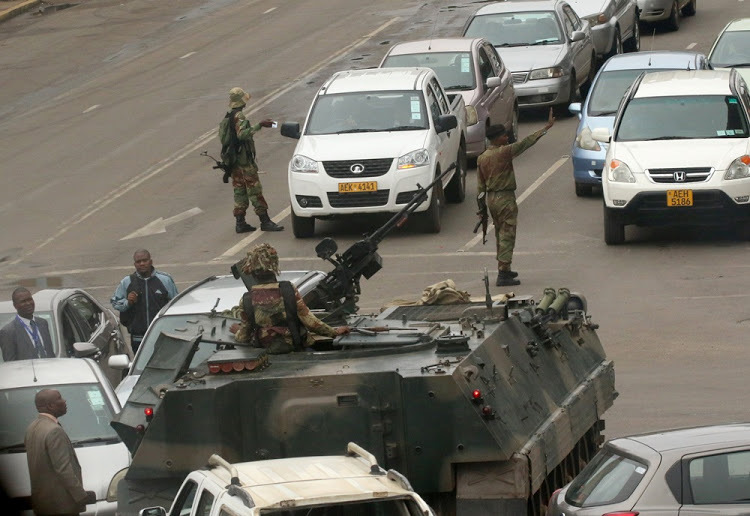 The army denied staging a coup in an early morning television broadcast on the state-run Zimbabwe Broadcasting Corporation stating that they are targeting criminals around Mugabe. “We wish to assure the nation that His Excellency Mugabe and his family are safe and sound and their security is guaranteed. We are only targeting criminals around him who are committing crimes that are bringing social and economic suffering in the country in order to bring them to justice,” the army said. They ordered the civil servants, judiciary and parliament to go ahead with their duties without fear of being obstructed. They also called on the public to remain calm and “limit unnecessary movement”. The military’s announcement follows hours speculations after armoured cars were seen blocking roads to the presidency and other state institutions. The army commander’s warning on Monday was described as treasonous by the Zanu PF party and the youth league which accused General Constantino Chiwenga of illegally interfering in politics. The army and war veterans expressed displeasure at the sack of Vice President Emmerson Mnangagwa who was also sacked from the party after rifts with Grace Mugabe and her faction over Mugabe’s succession. The army says the insecurity in the party is creating instability in the country which they want to address.